I am a huge fan of beetroot, this most amazing of domestic superfoods. Many of you long-time Foodtastic followers on here have noticed a while ago how much I love this veg. The bulb of the beetroot doesn't just sport a gorgeous crimson colour, it's also very healthy and extremely versatile. Sonnentor has released a new, trendy drink featuring my favourite red bulb - a Beetroot Latte. 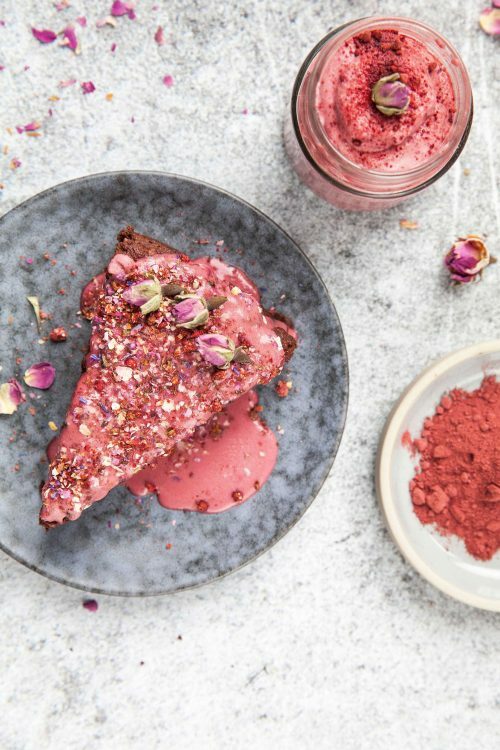 Beetroot tastes great as a combo with any plant-based milk, kind of like turmeric latte, but you can also use it for baking. I got myself some of that latte spice and mixed it into a chocolate cake with fresh beetroot. Yes, you heard that right - beetroot meets chocolate. Very exciting! And it looks amazing. My friends were skeptical to begin with, but were very pleasantly surprised by the result. Heat the oven to 180°C (fan) or 200° C (upper/lower). Chop half the chocolate. Put the other half in a bain marie and melt it. Mix in the coconut oil and combine well. Puree the cooked beetroot in a food processor or with a hand blender and combine with the eggs, honey, beetroot latte, almond milk, cocoa powder and a pinch of salt. Then add the coconut flour, baking powder, almond meal, chopped almonds and chopped chocolate and mix well in the food processor or with the handblender. Spoon the batter into a baking form lined with parchment and bake in the oven for 30-40 minutes. In the meantime whip up a glaze from the coconut milk cream, the coconut sugar and the beetroot latte. Remove the cake from the oven and let it cool on a rack, then take it out of the baking form with the parchment. Brush with the frosting and decorate with the Alles Liebe Gewürzblüten spice mix. This cake isn't very sweet. If you prefer it a little sweeter, just add more honey but add the same amount of coconut flour as well. Instead of honey, you could also use maple or agave syrup. If the batter is too dry, add a little milk.